First mover advantage is great, except when it’s not. If your product is truly innovative, your biggest challenge is likely to be explaining what, exactly, your product is, what its benefits are, and why anyone should buy it. Below are stories of three revolutionary technologies that faced these problems, and lessons for overcoming them. In 1994, Stanford University Credit Union began offering true online banking services to its members. They had the benefit of a tech-savvy customer base; Stanford University was an Internet pioneer, and credit union members (university staff and students) already used email extensively. They were able to make the analogy that it was like ATM banking, with which their customers were already familiar, but over the Internet, instead of at a dedicated machine. The questions from credit union members were practical: would it be secure? Would it be reliable? 1994 to 1997: Sounds good, but what is it? 2003 to 2006: Is it really secure? Despite the rapid spread of Internet usage, it took several years before the general populace even had a basic concept of what “online banking” meant. The 1982 World’s Fair in Knoxville, Tennessee introduced some amazing new products, from boxed milk to Cherry Coke. It also offered the public their first sight of a touchscreen, with 33 televisions covered with the new transparent touch-sensitive panels from Elographics. Sure, it was cool, but what was it for? It wasn’t until the end of the 1980s that touch screens found their first widespread practical use, in point of sale (POS) systems in restaurants. And it would be another decade before Microsoft’s and Apple’s new graphics-oriented approaches brought touch screens into the hands of the general populace. In and of itself, this technology wasn’t useful. It was only as it was combined with other devices, applications, and data-processing needs that touch screens found their market. In 1972, Andreas Pavel invented the first portable, personal music player. He called it the Stereobelt. He approached several electronics manufacturers about his invention, but none of these companies felt the public would ever wear headphones in public for listening to music. Sony also bypassed the traditional press and technology reviewers, taking the device straight to the public in the Ginza shopping district of Tokyo, and hiring young people to demo it for their peers. Apparently, the early 1970s manufacturers’ fears about headphones were justified, but Sony was able to counter this negative impression by letting people try the Walkman out for themselves, and hear the sound quality produced. Headphones haven’t been a stumbling block since. When you can’t say your product is “like X, only better,” you need to find a meaningful analogy. For online banking, the analogies were to other processes with which their customers were already familiar: touch-tone phone banking and ATMs. 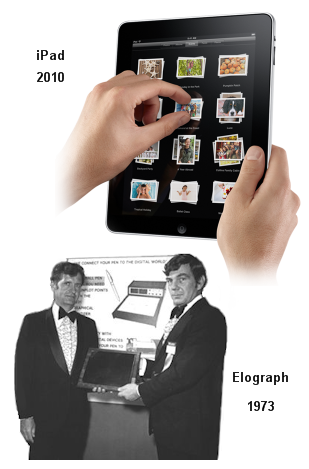 As those two technologies became more widespread, so did the ease of making that analogy. Touchscreens, despite lacking immediate practical applications, had an instant “Wow” factor simply from being tactile. Sony did its most effective marketing simply by getting headphones on ears. What if it’s an abstraction? Elographics, on their own, had a novelty. Once they were able to link touch screens to sophisticated computing devices, software, and marketing, they had a powerhouse. Not every company can offer a complete solution, especially if the “problem” doesn’t yet exist. If your cool new gadget is a technological wonder, make sure your tech guys are going to gadget conferences and seeing what other emerging technology can work with it. If you offer a service that might complement, rather than compete with, another company’s offering, talk to them about bundling. Sony ignored the skepticism of the traditional technology reviewers and took their product directly to the trendsetting public in the high-profile consumption center of Japan. With an innovative product or service, your product launch is aiming for the early adopters. Remember that finding and gaining the interest of this group takes different methods than those used to sustain a product once it’s mainstream. Early adopters buy other innovative products, and visit cutting edge websites. Find them where they are. As DEVO might say, when a (marketing) problem comes along, you must whip it. i am impressed with your knowledge! can i request you help in marketing my new invention?